NEW ZEALAND: New Zealand will tighten gun laws in the wake of its worst modern-day massacre, the government said Monday, as it emerged the white supremacist accused of carrying out the killings at two mosques will represent himself in court. “The reality is that after one pm on Friday our world changed forever, and so will our laws,” he said. 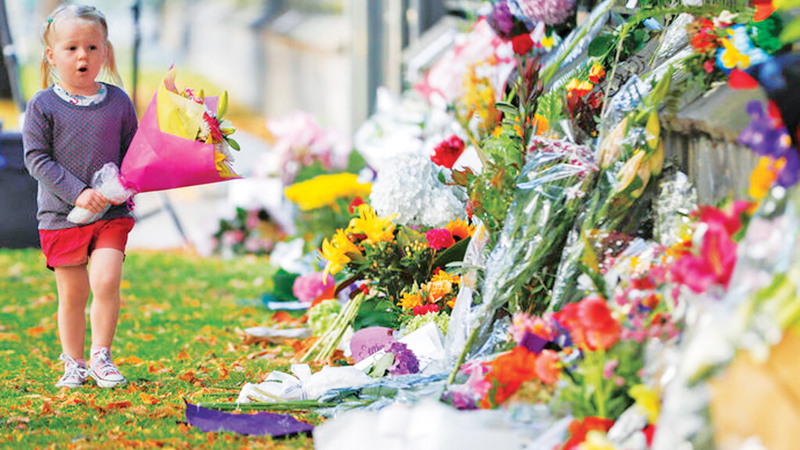 Ardern, the youthful premier who has become the face of the nation’s tragedy, said there would be an inquiry into the horrifying attack, as questions swirl over whether intelligence agencies should have spotted warning signs. And in Auckland, students at Orewa College gathered to form a heart and the message “Kia Kaha” -- “stay strong” in Maori. The organisers of New Zealand’s largest gun show -- the Kumeu Militaria Show, near Auckland -- announced Monday they had cancelled the event in the wake of the massacre and because of “elevated security risks” Despite having tightened the rules in the 1990s after the last mass shooting, New Zealand has relatively permissive gun laws, with nearly all of those who apply granted gun licences. Tarrant, who appeared in court on Saturday charged with murder, on Monday sacked his state-appointed lawyer. Richard Peters, who represented the alleged killer during the hearing, told AFP the 28-year-old “wants to be self-represented in this case.” “The way he presented was rational and someone who was not suffering any mental disability. He seemed to understand what was going on,” Peters said. Under New Zealand law, if Tarrant pleads not guilty his case would normally go to trial, raising the possibility that he could face survivors and victims’ families in court. Mustafa Farouk, president of the Federation of Islamic Associations of New Zealand, told reporters he had faith in the system. “We believe in the justice system here and we know it will do what is right.” But, he cautioned, the attitudes that gave rise to the killing -- documented in a rambling, racist screed released online minutes before the attacks began -- must be tackled. “This rise in hatred... by people who call themselves right-wing, whether smaller groups or through reckless politicians, should not be allowed to continue. “The process has been highly emotional and stressful for all... as in accordance with Islamic faith the families have wanted the bodies to be returned as soon as possible,” he said. “We have burial expert teams in place ready to receive the bodies at a point in time.” The dead from Friday’s attack span generations, aged between three and 77, according to a list circulated among relatives. Delhi said Sunday that five of its nationals were killed, while Pakistan said nine of its citizens were among the dead, including one man who died trying to rush Tarrant. Authorities said 31 people remained in hospital, nine in critical condition. The ripples from Friday’s horror continued to spread across New Zealand, with the brief shuttering of an airport in Dunedin after a suspicious package sparked a security alert.